← Attack Of The Killer T… Oh, Wait; That’s Been Done. In the past I’ve complained about various parts of my body starting to mutiny as I get older, so I thought I should give credit where credit is due: My ears are still loyal citizens of the Kingdom of Diane. Mind you, they do enjoy making me look like a goofball on a semi-regular basis. F’rinstance, they don’t necessarily translate other people’s speech accurately. Some of the things I’ve thought I heard would raise an eyebrow or two. But considering that they have to use my brain as an intermediary, my ears are probably doing the best they can. Their preferences can be picky and arbitrary. I always carry a set of earplugs because movies are invariably too loud. Same with live bands, and sometimes even noisy bars. Outdoors I shoot wearing sound-dampening earmuffs; indoors I have to use muffs and plugs because muffs alone don’t soften the reports sufficiently for my princess eardrums. But give me the fat lolloping rumble of a tricked-out big-block with straight pipes, and I’ll just grin and soak it all up earplug-free. Until I get to the drag strip and those pipes really start to bellow. Then I need earplugs again. But I don’t mind indulging my ears a little. They’re good ears. I can tell whether a CRT is switched on without even being in the room, because I can hear the high-frequency electronic resonance. When we had cats, I could always hear them coming by the sound of stealthy paws compressing the pile of the carpet. Anyway, I didn’t realize how dependent I am on my hearing until I had a bad cold and both ears got blocked. Apparently I cook based on sound. Whether it’s the barbeque or an open fire or the frying pan, I know it’s the right temperature when the food sizzles properly. Pancakes sizzle at a different frequency than, say, scrambled eggs. Foil-wrapped potatoes/butter/onions over an open fire should sizzle loudly but not crackle. Until my ears cleared I hovered anxiously over everything I cooked, wondering whether I was cremating it or barely warming it. Since I’m a gearhead, I’m also attuned to even the tiniest change of sound in my car. We were driving this weekend when I mentioned to Hubby that I’ve been noticing a very slight whine lately that might be drivetrain-related. He couldn’t hear it even when I hummed its frequency (admittedly not the most effective diagnostic tool, since I can’t carry a tune in a bucket). 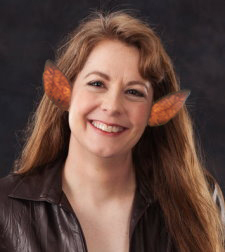 That’s me: Ears like a fruit bat. Oh, if only “Car Talk” were still around for you to call in to, and describe your issue…the fun they used to have with people mimicking their car sounds! I think I’d have probably paid money to hear you and those two guys on a call. My older brother and all my younger siblings were into caps in a major way. Our parents were blissfully unaware of a lot of the stuff we did, since there were only two of them and seven of us and we had bikes. My older brother got paid to mow the lawn, so he had all kinds of spending money and little reason not to spend it on box upon box of red perforated rolls of paper with dark bumps that smelled so good. Later it was revolvers that used yellow plastic magazines that banged even louder than a stack of caps. My younger brother got bit harder by black powder and bought a kit and made a black powder muzzle-loading rifle. This morphed into making his own high powered firecrackers and eventually bombs he used to blow up hills of sand dunes and peat bogs. It was astonishing that he could buy spools of safety fuse and hundreds of pounds of the ingredients he needed to make things go BOOM as a 15 year old boy back in the early seventies. His activities eventually caught the attention of the local bomb squad and the high school administrators. Luckily my brother was pretty careful and had no mental or emotional issues and would never dream of harming living beings or their property. He just used no wisdom in selling his “firecrackers” to his friends for 25 cents each. His friends would then resell them to other kids for a dollar each. One of these deep thinkers wanted to figure out if he was being ripped off with this homemade junk and lit one off and tossed it down an empty corridor in the school. The explosion cracked the concrete block wall and blew out the steel mesh-impregnated glass emergency exit doors nearby. My brother had a grocery bag full of these homemade firecrackers in his school locker and enough at home to blow the whole neighborhood sky high. Surprise, Mom and Dad! Your sweet little boy needs more supervision. He made it safely into adulthood and now has two sweet boys of his own. Yikes! It’s truly a miracle that we all survived! Hubby confesses to certain, erm… enterprises as a teenager, too. And considering that he grew up on military bases, you can imagine the scope. Yup. But what might be worrisome is that my brother is likely on the autism spectrum and may not use what he knows about himself to keep tabs on his sons. His older son is diagnosed as autistic and his teachers think he might never be able to live independently. But it is too soon to place bets, I think. They are truly sweet kids, though. As is my brother. Annoying, yes, but sweet and harmless, even though he still likes the occasional LEGAL boom. Personally, I think fruit bats are cute. Even their ears. When we lived way out in the country (more accurately known as the deep boonies) our house sat backed up to about 20,000 acres of Crown-Zellerbach land. Loads of wildlife and critters galore. We could stand out in the back yard at night and watch the bats fly right past us like crazy! They’d come in swarms, I think taunting us, but never touching us. It was crazy but fun at the same time. I was young then, could handle it better. Maybe they didn’t bother me cause they saw me dancin’ in the moonlight too often. LOL Hey, ya’ never know. For all they knew I might be one of them. HA! The funny thing is that I have pretty severe tinnitus, too. (Probably comes from taking the caps out of cap guns, piling them up ten deep, and lying on my stomach on a concrete floor with my face a few inches away while I hit the whole pile with a hammer. It’s a miracle I survived childhood.) But it doesn’t seem to affect the acuity of my hearing – I guess I’ve had tinnitus for so long that I just tune it out. Hahaha, we are all kindred souls it would seem. There’s hope for humanity after all! Hey, mankind! Need hope? Well, here we are! Well, pbthpbthpbth to you, too! Remember, we offered! Well, I figure that no matter how bad a fix the world is in, anytime you have a group of people willing to lay down on concrete, pile up the caps next to their ears then hit said caps with a hammer, that’s got to be a saving grace, right? Sure it is. It’s all good. No Creator could pull the plug on a planet when he/she has that goin’ on. My ears have a mind of their own, Diane… they sometimes deliberately mishear things – I’m sure of it! Although at times they do allow me not to hear things, which is very useful in the right situation. Pesky keyboard! Apologies for the ‘yminnian’ at the start there… it would also appear that my eyes allow me not to see certain things now as well. Sigh. What? Did someone say something? Great ears! You may start a trend. Great way to end the essay too, by the way. I’m afraid my hearing has become worse as I’ve become older. I now can’t catch high ranges at all. When I go to watch a movie, James Earl Jones will say something and then everybody else silently opens and shuts their mouths. I could apparently use some bat ears that’s for sure. No need for earplugs for me when out to a bar or around a crowd. Yup fruit bat envy here. LOL! You’d think that somewhere in here there should be a happy medium (and I don’t mean a jolly channeller of spirits… which could also be a cheerful bartender… okay, I’ll stop now). When I’m on a cinnamon roll, Hubby calls me Sweet Cheeks. I lost the high frequencies long ago, but I hear the rumbles just fine. Like your husband and husbands all over the world I too have a “wife zone” that filters out quite a bit. At least she thinks so. That’s interesting you use your ears to cook. I never thought about that, but it makes sense. We rely on our vision so much, but other senses do play a part in our activities, and I suppose we don’t give them enough credit. I imagine the visually impaired could teach us a thing or two in this department. I also am intrigued by the idea of cooking by sound. I bake by smell more than time. But if doors or windows are left open the food will be burned to charcoal briquettes before I notice. Coffee roasting is most definitely a hearing skill. But differentiating between first crack and when the oils just start to release is visual. I’m glad I still have all my senses or is that wits about me? Alas, what I could diagnose around any machinery by sound, I have to do by vibration alone now. Even with hearing aids, the ability is fading. Too many years of, well, all the noisy crap when ear protection either wasn’t available or worse, wasn’t cool. And look! The plot lengthens! You tho rock, thithter! Fuzzy ears are much better than leathery bat-ears! At least you’ll be warm the next time one of those blue northers sweeps through. That’s always been the problem with hearing protection, hasn’t it? Quite apart from the coolness factor, it’s always been so bulky and inconvenient, especially when you also need to hear important stuff above the ambient noise. I’ve just been looking into the electronic noise-cancelling earphones for shooting, but I have the same issue with them as I do with auto-darkening welding masks: what if they fail? Yikes. LOL! Some things just can’t be adequately muffled. How odd that you are so hyper-attuned to the nuances of the various frequencies as different foods cook and motor vehicles rumble but can’t copy the various frequencies of the Western musical scale. It seems to me that you should sing gloriously well and with perfect pitch. Is it merely untapped potential? Voice lessons might reveal a new Rene Flemming, Joan Southerland or Maria Callas in you. Perhaps the Western scale is the problem. Maybe you should have been born in India, for example. Good heavens! Shut my mouth! Perish the thought! If you spent all your time singing we’d never receive installment number 11 or 12! We’d all be the worse for a life without more Aydan, Hellhound, Kane, Spider, and even Stemp. I don’t think even a new hobby could distract me from my writing, though – I enjoy it far too much! It does have a nice ring to it! Giggles lots, I’m with you on sounds. My hearing is very sensitive, I can hear everything and anything. We have a lad at work who will turn the radio down so he cant hear it, but I hear the whine and adk him to just turn it off. I can hear my name from across a crowded room. I find it both a blessing and a curse. I’ve also had vold recently and like you both ears went, I still had most but list the top and bottom of my range. Its back now but you not half miss it. Glad your back to hearing of a bat, I’m glad I have my hearing back too. I do use my phone, it normally does a great job where I cant spell but sometimes it’s just as bad. I love how my ears will auto tune themselves to certain words, normally naughty words or what my brain combined with ears thinks is naughty. But then I work in IT and I’m sure its part of the job description to go to the dark side of innocent comments, the strangest things make us smile.